Welcome to the Day 2 of 2 Christmas Paper Piecing Blog Hop! If you have hopped over from Patti’s blog – you are on the right track. Otherwise, if you want to start back at the beginning so you don’t miss anything you can head over to Nikki’s blog. This hop was brought together by Nikki from Paper Piecings by Nikki. She is looking for a Design Team so if you are interested, you’ll definitely want to be contacting her! Christmas is one of my favorite holidays when it comes to crafts! The possibilities are endless! I was able to get away last weekend to a scrapbook retreat and just spend the entire weekend scrapbooking-I was in absolute heaven! As long as you don’t count the fact that I got maybe 5 hrs of sleep total in 3 days lol! Anywho – here is one of my layouts that I created. Are these not just the cutest penguins ever! I love making penguins! 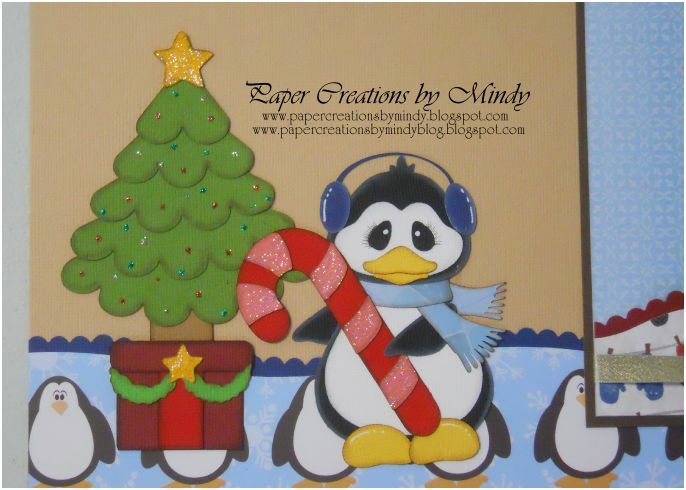 These little guys came from Holiday Cheer file at Treasure Box Designs. Designs on Cloud 9 is my sponsor this weekend for some blog candy! Now head on over to Amy Jo’s page to see what fabulous project she has in store for you! Thank you so much for visiting this weekend – I hope you were able to walk away with some great ideas. Be sure to check back often as I am in a lot of hops this month with a TON of blog candy to follow! In case you get lost along the way, I’ve included the entire line-up below. Wow Mindy!! Amazing!! Absolutely adorable!!! I LOVE those cute little penguins!! I will have to get going on a penguin set after seeing this 🙂 I am beside myself with all the talent that I've seen on this hop!! Thank you again for participating with us 🙂 Be sure to visit my Facebook page tomorrow for the new DT announcement! 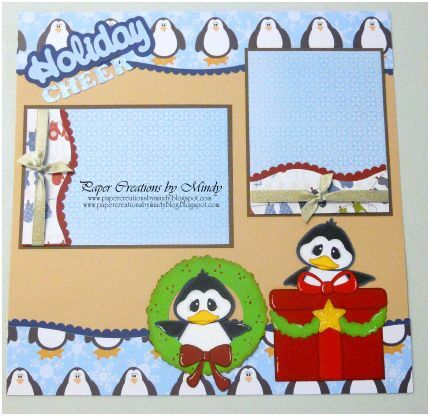 WOW you did a great job on this layout, them penguins are so darn cute! 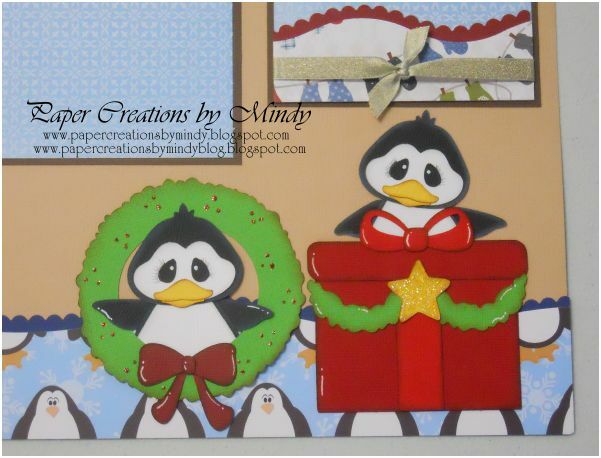 another adorable layout, love these little penguins. I really like how you do your layouts! Love this layout! Beautiful job!!! OMGoodness, this is just the cutest EVER! I love Cloud 9. They are one of my faves. Thanks so much for sharing your great work with us. I'm already a follower and a fan of your FB page. Would love to win that prize so thanks for the chance! Oh my, you have just become one of my favorite layout designers!! Really great job!! You and I thought a like – we both used penquins – aren't they cute? Great job on your layout. This is a very darling LO. The right balance of piecings/embellishments and photo mats. Very well done. 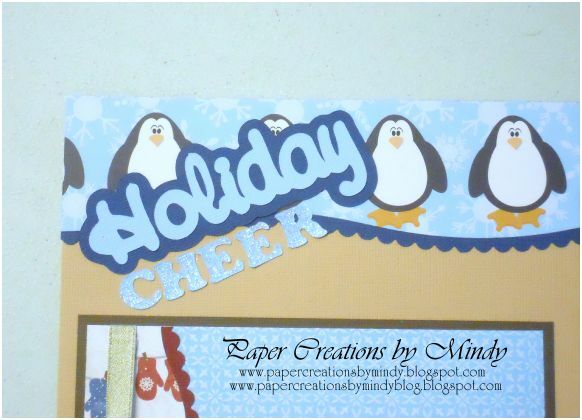 What a super cute layout, Mindy! Thanks for the chance to win as well!! I'm a new fan and follower!